Ah, coffee. I could not imagine my life without you. I dream about you at night. I spend hours sipping you in the mornings, and get sad when the pot is empty. Sometimes I will make two pots. But only on special occasions. Coffee, you are my soulmate. My one true love, and the only constant in my life outside of er…uh, mah husband. He loves you, too (but not as much as me). After all our years together, coffee, I think it’s time we get a little more healthy with how we sweeten you. After all, you deserve nothing but the best ingredients. There’s been plenty of well-publicized debate on whether coffee is good or bad for you, but I’ve come to terms with the fact that I drink coffee like a regular addict. It is what it is. And until recently, I never really put that much stock into the creamers I was using. I switched to mostly organic food a few years ago. My skincare followed soon after. But the one thing that I never stopped to regulate or even investigate was my one daily indulgence: coffee creamer! Store-bought coffee creamers are generally not made up of actual “food.” At all. Common ingredients are corn syrup solids (yum!) or partially hydrogenated soybean and/or cottonseed oil. Partially hydrogenated oils = trans fats. There are also a lot of additives and preservatives in commonly used coffee creamers, and aside from tasting DELISH, they are likely doing you more harm than good. When you think of how much creamer you use in a week: 3-4 tablespoons a day (be honest, girl) x 7 days a week = up to 28 tablespoons of this gunk weekly. Oh…but they have so many flavors now though, don’t they…? Cookie Dough. Bailey’s. GIRL SCOUT THIN MINT?! So. So. So. Tempting. Well, I have a solution for you that is not only cost effective, but also YUMMY. A 16 oz bottle of Coffee-mate will set you back around $3. My solution will give you 30 oz for around $6. Not bad, eh? 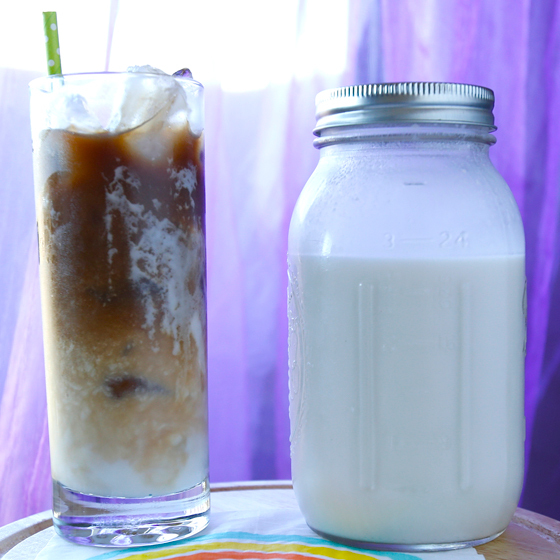 There are ways you can adapt this creamer to make it into one of your favorite flavors, and it will turn your coffee nice and creamy, like store bought creamer does, but without all the nasties. It’s also dairy-free for any of you with sensitivities. Each tablespoon is around 25 calories. All you need is five minutes and some cool glass mason jars. Let’s do this!